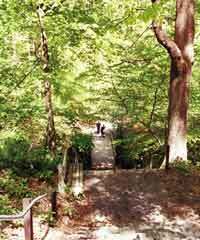 Steep ravines covered in hemlock and other mixed oak-hardwood forest comprise the 465 acres of the park that are designated as part of the Natural Areas System. Here, rare plant species, including Virginia pennywort and leatherwood, live under special management practices. Endangered and threatened non-game species, like the wood turtle, Cooper's hawk and barred owl, have sufficient managed habitat in the park to support populations. There are over 100 bird species to watch. A long stone staircase is the entrance into 892 acres of woodland, beautiful, serene, and you won't get lost or eaten by bears. Head down into the woods, into a three-hour fantasy, far from the nearby crowds and din. The forest is a mix of majestic yellow poplar, American beech, yellow and black birch, ironwood--or musclewood, with sinewy trunk and branches, flowering dogwood, and red and white oak. I went to the woods to feed my soul, to gain back energy drained by a fast paced life. I found what I was looking for at Hacklebarney State Park, tucked away between Chester and Long Valley. It was a massage for the senses, elixir for the mind, balm for the body. Hacklebarney offers the sighs of tall trees on a hot summer day, beams of sunlight straight off a prayer card, and melodies of birds for my ears only. Life is cooler in the woods, too, under the shade of the forest. I enter the park on a graveled path along a ridge above a stream. Below the hill is a mixed forest of majestic yellow poplar, American beech, yellow and black birch, ironwood--or musclewood, with sinewy trunk and branches, flowering dogwood, and red and white oak. The weeds of society have followed those who traversed this path: Japanese barberry--bane to native trees and shrubs, poison ivy, vinca, Virginia creeper--even pokeweed. I turn off the path and head down into the woods, down a built staircase that takes me into a three-hour fantasy, far from the nearby crowds and din. My German shepherd companion, Arnuk, and I zip across the Trout Brook's wooden bridge into the woods. 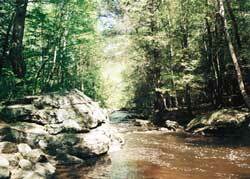 The Trout Brook is designated as a "wild trout stream." It's not stocked, but is managed to conserve its wild trout population. The last blooms of pink-flowered native azaleas and white-flowered honeysuckle shrubs appearing periodically along the stream, and the sound of water tumbling over rocks, help strip us of the bustle we came from. Dappled sunlight on the forest floor reveals a mixed growth of grasses and ferns, purple and white violas, nettles, wild impatiens, and berry bushes. The increasing roar that fills the air tempts me closer to its source. Arnuk and I bound between boulders till we find it ­ a small but strong waterfall coursing to the Black River. We head up a short rise. Here the path was recently graveled. The dense shrubbery softens the sound of the stream, and a sweet scent drifts through the trees. Is there always a breeze in the forest to stir the senses along with the leaves? A few dying hemlocks still stand on a north-facing slope; the towering beech and oak have given them a run for sunshine. Maple-leaf, arrowood, and blackhaw viburnum, honeysuckle, witch hazel and young trees grow thickly, filling the understory. The knocking of a pileated woodpecker sails through the forest, as does the distant whir of a small plane engine, a reminder that civilization isn't far. The rise is just enough for the faint of heart--me. 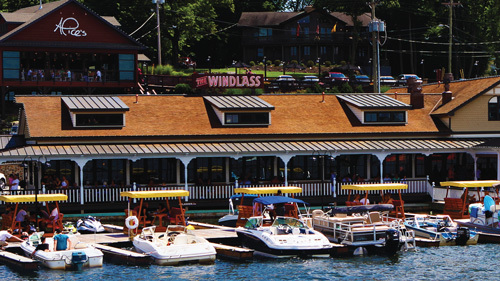 There are picnic tables and grills scattered to please, and stone restrooms strategically placed for convenience. Hacklebarney is a forest to take your time in, for those who dread a climb, with obstacles to grasp and conquer. An old stone wall, running down the hill from the left, is a remnant of homestead boundaries, the kind used long before fences, before the state acquired the land in 1924. Arnuk and I saunter along the downslope now, full of the feeling of wilderness to a city woman and dog. On the right, just behind a white oak with a cavity that says "bear", are four stone blocks, further evidence of a history other than "state park." The sounds of town fade. They are replaced by bird song and the rush of water. We're in the deep woods of Jersey now. Arnuk hears the crackle of leaves under the feet of a forest critter and bounds off the trail. At the sound of my voice she snaps to attention. Arnuk is my sentinel in solitude, my eyes and ears in the wilderness. She's here for bear protection, for I'm not up to a one-on-one today. Down along the bend, bright stands of native day lilies fill the edges on both sides of the path down to the end at the Black River, a "trout-stocked waters." It's mid-day and Karen Sanabria and her father, Floyd Cornelius, both of Toms River, and their dog Holly, are here to walk in the woods. This is Mr. Cornelius's third time in a few months. They love Hacklebarney. The dogs play and we talk in celebration of meeting in these Robin Hood woods. We stand on outcrops jutting over the river and gaze in awe at the grass, moss and seedlings living in the rocks brought here by glaciers. Across the little river is one of the state's designated "Natural Areas." 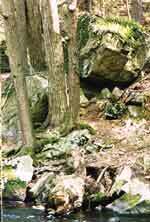 Hemlocks, softened with age and lichens decorating their limbs, cover the cool ravine. There are ways to cross the river to stand in the hemlock garden, to rest on the rocks, to savor the cool on your face and the quiet of the woods. Along the path, there are gardens of marshes where skunk cabbage grows like nature's hostas. Ferns, azaleas, and Solomon's Seal sprout from the trunk of an uprooted hemlock. But the forest regenerates! There are stands of young hemlock on the hillside. The only sound now is the river. And across it lays a fallen red oak, its stump now home to invertebrates, white violets, grasses and ferns, and seedlings of birch trees. The trail becomes rocky along the river. I'm thankful I wore my hiking boots. I'm mildly concerned that I might get lost now, without a clear-cut path to follow. I think of sled dog drivers in blinding snow, trusting their lead dog to find the way to bring them home, so I trust Arnuk. She leads the way and I follow. We come to the Trout Brook again, and see there are three ways to cross it without getting wet: balance on a fallen ash tree, walk a man-made footbridge, or jump across the rocks. While I deliberate, Arnuk chooses the footbridge. I follow her. There are yellow birch here at this junction of the Black River and Trout Brook, with shiny peeling skin. The birches are an entertaining genus. Crush a leaf of black birch and it's almost like a calorie-free root beer. Chestnut oak, yellow poplar, black gum and birch surround a large picnic area with tables, grills, and a just-in-time stone outhouse. We leave the Black River and head uphill. As the trail departs the rocky strata of the riverbed, I hear thunder in the distance. But the sun shines, the breeze blows, the birds twitter. Thunder turns out to be a jet--civilization never leaves. A car approaches down the soft path. The park's Visitor Service Assistant answers my questions and tells me Arnuk must be tethered. I apologize to the good dog and put the leash on her, then let her run ahead. Soon gravel appears on the path, and I know that we are headed in the right direction. One can't get lost in Hacklebarney, and I haven't seen any bears: a worry-free afternoon in the New Jersey wilderness. But what is this on the road to peace? Tar? Oil? Drowning delicate life on the edges? Long shadows start to fall. Soon there is a playground for kids, with swings. Even our woods, with their sense of remoteness, play to the tune of suburbia. The uphills of Hacklebarney are just long enough to make me feel like I got some exercise, and the downhills are gentle on the knees. And I experienced a bit of history, too. The original office, maintenance shop, stone outhouses, some cement-anchored picnic tables, and trails were all put in by the Civilian Conservation Corps in the 1930's. I saw the once-raging, and now dammed, Black River that the Lenapes supposedly followed, somehow, to the shore, and pounded their grain on flat rocks or "mush pots." So next time the job is stressing you out, and you're feeling the pressures of cyberspace life, toss your sneakers in the car and jump off Route 80 or 287 or 206 to Chester on Route 24. Follow the signs to the best-kept secret in the state. Carry water with you. It's limited in the park. Watch the signs for parking areas. You won't get lost. Dogs are allowed, but must be leashed. There's good fishing. Get a license. To keep the trout, you must have a "trout stamp." Call ahead and they'll send you a map. 908-638-6969. The park is busiest in spring and fall. In the summer, if you can't get into other areas to hike, come to Hacklebarney. There'll be room for you. 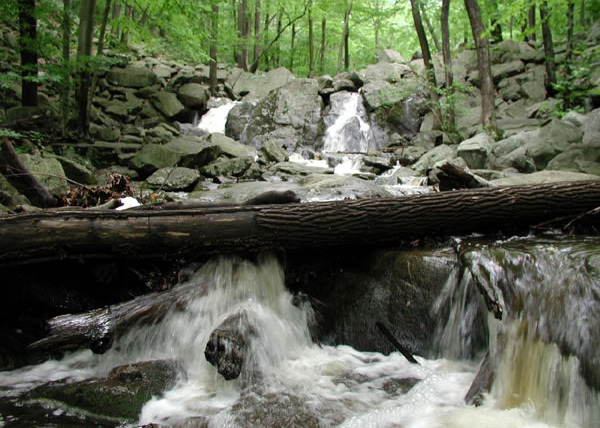 The story of one of the Northwestern New Jersey's largest and more improbable natural treasures, a fist shaped swath of land designated in 1987 as the Pyramid Mountain Natural Historic Area, nearly 1,500 acres of wooded terrain dotted with brooks, swamps, glacial deposits, rock outcroppings glens and vistas.